The trend in laptops at CES 2012 is clear: It’s all about thinner and lighter laptops made with premium materials and slick design. Intel’s attempt to brand exceptionally thin and light laptops as “Ultrabooks” has been very successful, with nearly every laptop vendor jumping on board. Even laptops that don’t meet the requirements of Ultrabook branding, such as those using Intel Atom or AMD CPUs like the Asus Eee PC Flare, are slimmer, lighter, and better-looking than the comparable systems of the last few years. Some vendors are simply forgoing the Ultrabook brand name. Vizio’s dramatic entry into the PC market seems quite impressive, and while its thin-and-light 14 and 15-inch laptops meet the requirements to be called Ultrabooks, the company says they’ve been working on them since long before such a brand existed, and prefer it not be used. Dell’s sleek XPS 13 is the same story. What do these systems, and many of the other hot laptops of CES have in common? They’re a lot thinner, and they’re made with premium materials, such as solid blocks of aluminum, carbon fiber, or in the case of the HP Envy 14 Spectre, lots of Gorilla Glass. In fact, this CES marks the introduction of the thinnest laptops we’ve ever seen. The Aspire S5 from Acer and the new Series 9 from Samsung are so skinny they make Apple’s Macbook Air look positively chunky. Acer claims the Aspire S5 is the world’s thinnest laptop, but the new Series 9 will ship several months sooner. The Blade laptop from Razer may not be especially skinny (at 0.8-inches) or light (at 6.6 pounds), until you realize that it’s a 17-inch gaming laptop. For products in that class, it’s like a runway model. 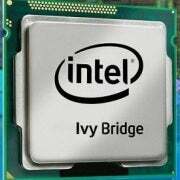 Some of these svelte laptops will ship this spring, but many more will hit the market in the summer and fall, after Intel’s third-generation Core processors (code-named Ivy Bridge) hit the market. These smaller, faster chips should operate more efficiently than the current Core processors, making them easier to cool in these tight laptops, while delivering longer battery life. Though we have seen laptops with touchscreens in the past, we’re seeing a few more now that Windows 8 is on the way with a greatly improved touch experience. Most of the touch-enabled laptops at CES are concept models designed to convert into tablets. With Windows 8 half a year away or more, we’re not likely to see many finished products tailor-made for the OS just yet. Watch for big changes from Windows 8. If CES 2012 is any indication, this year will mark a push away from the commoditization of laptops. Yes, the cheap, heavy, thick, plasticky laptops of the past few years will still be out there, but all the buzz will be around laptops that look great, run cool and quietly, and are easier to carry. There will be more of these to choose from than ever before. If the last few years were a race to the bottom to see who could make the most affordable laptop, 2012 is a race for quality to see who can make the most desirable laptop. Dell laptops of the last few years have been mostly…boring. Boring, and sort of cheap-feeling. It seems as though Dell was leading the charge in a “race to the bottom”, producing inexpensive and bulky laptops that could be outfitted with a wide variety of upsell options like faster processors or bigger hard drives. Sometime last year, it seems as though the company caught on to what customers want these days: fewer confusing options, better design, and quality materials. The XPS 15z was the first laptop from Dell I had seen in a long time that really got it right, and the XPS 14z continued the legacy. Imagine my surprise, then, when I first took hold of the XPS 13 (there’s no “z”) and found it to be even more impressive. Dell says it has been working on this design for at least a couple years – since before there was an Ultrabook designation for laptops, though it certainly qualifies for that category. 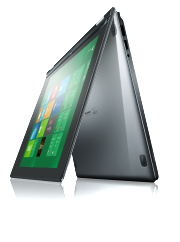 The XPS 13 is as thin as most Ultrabooks at around 0.7 inches, tapering down to 0.24 inches. The main body is a mix of mag-alloy, and aluminum along the lid and keyboard deck, with a primarily carbon fiber body. This makes it quite rigid, while keeping the weight down to just a hair under 3 pounds. Last spring, Samsung impressed me by kicking off its high-end luxury Series 9 brand with an incredibly thin and light laptop. It was a fantastic competitor to the Macbook Air that came months before every laptop maker started cranking out Ultrabooks. In some ways, you could even call it the “proto-Ultrabook.” So if you’re Samsung, and everybody else has a similarly slim laptop on the way, what do you do for an encore? Apparently, you go even thinner. 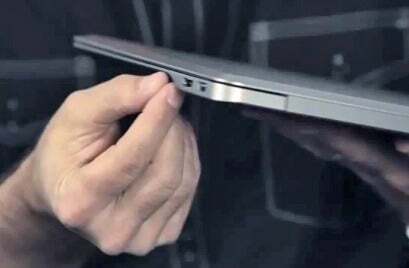 Thinner, in fact, than any other laptop we’ve yet seen. The new 2012 version of the Series 9 is so skinny it’s practically a tablet; it’s only 0.5 inches thick and 2.5 pounds. I’ve been using a pre-production unit for a few days now, and it’s certainly impressive. The matte anti-glare 1600 by 900 display is very bright and crisp, and the overall build quality is top-notch. Pre-production systems usually lack the fit and finish of final production systems, but this one is tight and solid. The aluminum unibody construction is very rigid. The lid is almost impossibly thin, yet it prevents nearly all flex in the display, and the hinge doesn’t suffer from even a hint of wobble. There’s not a lot of room for ports in a laptop this slim. You get one full-sized USB 2.0 port on the left and USB 3.0 on the right. An SD card slot hides behind a little pop-down door on the left underside edge. The headset plug on the right is the typica 1/8-inch size. For everything else, you’re looking at mini-plugs and dongles: mini-HDMI and an Ethernet dongle port on the left, and a VGA dongle on the right. Most users won’t have need of these, but it’s worth noting that business travelers will likely need to carry a few extra bits and bobs in their bag. The full-sized keyboard has very little key travel – a common issue with super-thin laptops – but it’s still quite easy to type on. The large touchpad has a great feel, but is currently a little hard to use. I’m told this is a software issue with the preproduction unit, and one of the key areas Samsung is focusing on before release. Windows 8 is designed to be at home on both traditional PCs and tablets. Lenovo is taking this to heart with a products designed to be both. 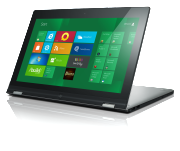 The Lenovo IdeaPad Yoga (yes, that is both the development code name and the final product name) takes a 17mm thick Ultrabook and gives it a screen that can flip back on a pair of double hinges. It’s a neat design that turns the 13.3-inch laptop into a rather large tablet. While the system is thick and heavy by normal tablet standards, it’s a lot thinner and easier to carry than any convertible notebook we can remember. The IdeaPad Yoga is designed with Windows 8 in mind, and should ship right around the launch of Microsoft’s new OS, likely in the second half of this year. There are no official specs yet, but it will use Intel’s next-generation (Ivy Bridge) processors. 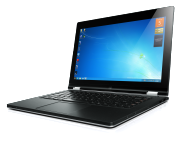 You’ll notice a lot of similarities to the design of the IdeaPad U300s, Lenovo’s current Ultrabook. The aluminum construction and general shape and size are similar, though Lenovo has replaced the wrist rest with textured plastic that has a “leather-like” feel to it. The display has obviously changed as well, as the Yoga sports a capacitive touchscreen with 10-point multitouch. It’s also loaded with the sensors you’d expect in a tablet, like GPS, gyroscope, and accelerometer. just plain weird about using the system in tablet form, with the keyboard on the back. How long will the keys last when people just jam the thing into their bag in tablet mode every day? Do people value a laptop that can turn into a tablet enough to live with a tablet that is comparatively thick, heavy, and hot?